Arthur Boyd was a man ahead of his time. His forethought not only led to the gift of Bundanon Trust to the nation but to its environmental integrity in the present day. Situated on a deep bend of the Shoalhaven River, about 20 minutes from Nowra, Bundanon is a natural and cultural hub for artists from all over the world. Siteworks is Bundanon’s annual major event. This year’s theme focuses on what does not belong, with the apt title of The feral amongst us. How do we decide what is “natural” and what is out of place? Here site specific and immersive works from throughout the year merge with offsite projects in a melting pot of artistic genre, site, colour and sound. It draws together the diverse programs and contributions by visiting artists into a massive, two-day collaborative program, open to the public and free of charge! This year’s theme focuses on what does not belong, with the apt title of "The feral amongst us". Bundanon has ‘high artistic aims combined with local community engagement’ says John Bayliss, who is tasked with organising the big event. Attended by over a thousand people who are prepared to experience contemporary art they wouldn’t usually seek out, it’s about presenting ‘sophisticated art in a relaxed environment’ says John. Siteworks is not an academic conference; it’s an experiential discussion and artistic expression of ideas based on a theme. This year, camping will be provided for onsite to enable more people to participate in nocturnal activities, like night parcour through the bush for the brave! NIDA students have constructed a ‘feral shed’ and even the iconic, Glenn Murcutt designed Education Centre doesn’t escape the action. Some of the activities on this year’s program include: Feral Jounrey- a guided tour of the botanical reality of Riversdale (Diego Bonetto) Interactive performance; Whelping Box– (Branch Nebula) Video; Bush Session (Branch Nebula) Performance; BioPods_02, the nebuchadnezzar suites (Nigel Helyer) Interactive installation; Anti-Context (Sarah Breen Lovett & Sydney UTS design and architecture students) Architectual installation; Ugly Ugly (Roslind Crisp) solo dance work; U.F.O (Unidentified female object– Rakini Devi) Performance installation; It’s like… (Team MESS) Performance, and many more yet to be announced. Afternoon talks by speakers such as Robyn Archer AO, Professor Marcia Langton AM, Professor Adrian Franklin, Dr Fiona Probyn-Rapsey, Clarence Slockee, Professor Deborah Bird Rose, Professor Richard Goodwin, award winning author Tim Low and others will deconstruct the meaning of human co-existence with animals and plants. 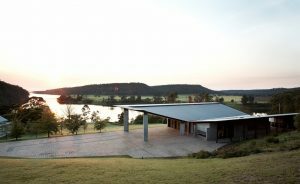 The Artist in Residence (AIR) program is at the heart of Bundanon’s suite of offerings and is now the largest in Australia, hosting over 3 artists a year. Up to ten artists can be accommodated at any time at the riverside centre which now includes a dance studio. A strong network of AIR alumni support events like Siteworks, providing a rich talent pool from which to draw. Since first acquiring Riversdale on the Shoalhaven river in 1974, Arthur and Yvonne Boyd worked tirelessly to remove invasive weeds like lantana and to restore the unique bushland. Bundanon Trust continues to honour Arthur and Yvonne Boyd’s commitment to its conservation with the support of a dedicated board, 14 full time staff and dozens of volunteers, including its own Landcare group. Siteworks is a celebration of the Boyd’s environmental principals, the collective achievement of all who labour to honour them, and the extraordinary legacy they left for us to enjoy.